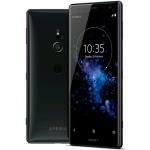 The Sony Xperia XZ2 (H8296) is the just-released phone from Sony, and its big on display, performance and photographic quality. The display on the Sony Xperia XZ2 is clear and easy to read, with a 5.7-inch IPS LCD touch display and top-notch screen resolution: 1080 x 2160p with 424ppi pixel density. The Sony Xperia XZ2 promises powerful multimedia, gaming and graphics performance, certainly the equal of many of the top smartphones on the market. This is made possible by a winning combination of Sony Triluminos and X-Reality Engine tech, and built-in Adreno 630 GPU and Qualcomm Snapdragon 845. Like any premium model, the X72 has a lot to live up to in the camera department and it doesn't disappoint with a powerful blend of quality cameras front and rear. The rear Motion Eye camera is a stunner, boasting a 19 MP sensor with predictive phase detection and Electronic Image Stabilization, particularly good for recording high-quality 4K video. The Sony Xperia XZ2 doesn't just look good - it sounds good too! In this day and age when we're creating mini-movies on our smartphones, we need great audio to partner with the footage we shoot. The S-Force Front Surround stereo speakers on the Sony Xperia XZ2 deliver exceptional audio, certainly some of the best you'll hear in any smartphone. The 3,180 mAh battery is big enough to provide ongoing use and can be quickly topped up with Quick Charge 3.0. A newer model Sony Xperia XZ3 H8416 64GB was released in July 2018.